Research into daily physical activity (PA) patterns of older adults (≥70 years) has primarily relied on self-report. 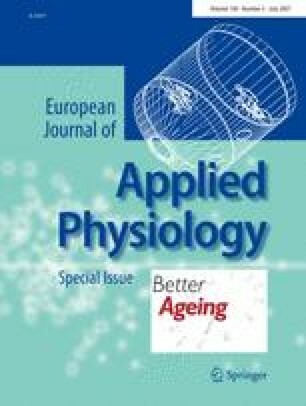 This study used accelerometry, an objective measure of minute-by-minute movement, to assess PA volume and intensity performed by older adults recruited to the Better Ageing project. Results were used to estimate the degree to which current health recommendations for PA were met. Participants [91 older females (OF) aged 76.0 ± 4.0 years (mean ± SD), 70 older males (OM) 76.3 ± 3.9 years, 23 young females (YF) 26.8 ± 4.1 years and 22 young males (YM) 27.0 ± 4.2 years] wore an MTI actigraph model 7164 recording activity in 1-min epochs for 7 days. Only those with at least 5 days, and 10 h of actigraph data per day, were included in the analysis, using Caloric.Bas (CSA Inc. 1999) software and a tailored Microsoft Access 2000 macro. Mean counts min-1 day-1 were 37% lower for older adults than for young adults [OF 236.1 ± 84.4 vs. YF 370.0 ± 81.1 counts min-1 day-1 t(114) = −6.86, P < 0.001; OM 255.1 ± 103.0 vs. YM 404.3 ± 134.0 ct min-1 day-1, t(91) = −5.55, P < 0.001]. Older adults were more restricted in activity intensity range performing significantly fewer minutes of moderate to vigorous (MV) PA day-1 than young adults [OF 16.7 ± 12.2 vs. YF 38.4 ± 18.4 MVPA min day-1, t(114) = −6.90, P < 0.001; OM 23.8 ± 20.0 vs. YM 40.4 ± 19.2 MVPA min day-1, t(91) = −3.47, P = 0.001]. Nearly half of older adults did not perform any sustained 10-min MVPA bouts (OF 48.4% vs. YF 13.0%, χ2 = 8.10, P = 0.004; OM 44.3% vs. YM 4.5%, χ 2 = 9.97, P = 0.002), and none met current PA recommendations for health. This study is the first to provide objective data on a large sample of adults aged 70 years and over and indicates low levels of daily movement that are likely to be inadequate for optimal health benefit.